Tomorrowland is the worst movie I've seen all year. It's so bad that it might dethrone Jupiter Ascending as the absolute worst film of 2015...and actually, of all time, past/present/future, a feat no film should ever aim for. In turns mind-numbingly dull and freakish, Tomorrowland goes out of its way to both cash in on the Disney connection and destroy Uncle Walt's ideas simultaneously. I don't think I've regretted going to a film as much as I have with this one...and I've seen Howard the Duck. At this point, I'd give a far-too-long plot synopsis, but fortunately Tomorrowland doesn't have a plot, just a series of incidents that don't seem to tie into each other. It also doesn't help that from time to time, I was dead asleep at this horror, but I'll do my best to give as close to a description as possible. As I understand it, George Walker, a little boy who travels to the New York World's Fair of 1964, goes there to show his jet-pack. He is inspired by Walt Disney's vision of the future, but the judge, Mr. Nix (Hugh Laurie) rejects his project. However, his 'daughter', Athena (Raffey Cassidy), who might find him cute, gives him a pin that leads him via the It's a Small World ride at the fair to a fantastical new world, Tomorrowland, a world of scientists and intellectuals far from the madding crowd (where was Ayn Rand when you needed her?). Years later, a bright girl surnamed Newton (Britt Robertson) is trying to save a rocket Launchpad NASA is dismantling. Her father, Eddie (Tim McGraw) accepts that he'll be out of a job, but his daughter Casey won't. Somehow, sabotaging the site is considered a crime, and she is arrested. When she is bailed out, among her possessions is a pin she doesn't recognize. Whenever she touches it, she finds herself in a magical world, but the pin leads her into trouble. She tries to find the source of the pin, which leads her to leave Houston home and go to Atlanta, telling her father she's going camping. At the shop she goes to, robots try to kill her, but Athena rescues her. 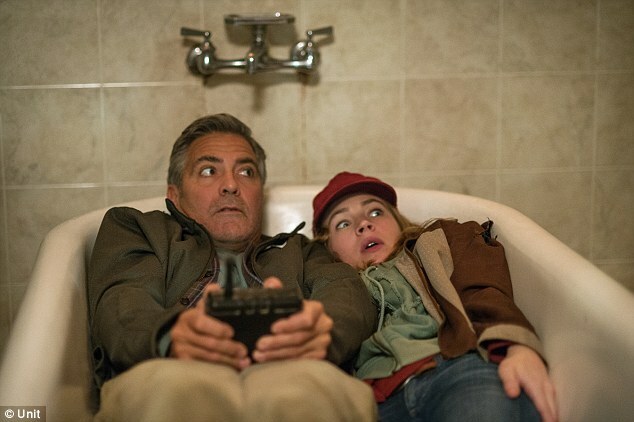 Pursued by thugs, eventually Newton seeks George (George Clooney), who for reasons vague and boring, is not in Tomorrowland anymore, but is a bitter recluse. Thugs keep after them, they go to Tomorrowland, Athena is a robot too, and something about Nix determined to save his world because our planet will be destroyed in 56 days due to climate change. Or something like that: Tomorrowland is vague on a lot of things. Director Brad Bird, who co-wrote the script with Damon Lindelof from a story by them and Jeff Jensen (though I suspect more hands were involved in this mess), appeared to forget something that I think is extremely important. Walt Disney was an eternal optimist (his in-house songwriting team of Richard and Robert Sherman wrote There's A Great Big Beautiful Tomorrow for the Carousel of Progress exhibit, later ride, at the 64 World's Fair). Tomorrowland is a hopeless bleak film, convinced that the world is about to enter inevitable destruction unless the younger generation takes over (and I figure remake the world). In just about every other respects, Tomorrowland is a disaster. The story goes all over the place, making the film feel even longer than its two-hour ten minute running time. The idea that Newton (already the characters have such heavily symbolic names) would tell her dad she's going 'camping' after getting arrested, AND HER FATHER AGREEING TO THIS, is idiotic. That is already bad enough, but Newton doesn't bother contacting Eddie for a long period of time, making me wonder what the point of Eddie or her brother Nate (Thomas Robinson) was. Even worse is the violence in Tomorrowland, which was targeted at families and children. The film goes way beyond what I think is PG territory and which should have been rated PG-13. I am aware that Athena, we discover, is a robot (Audio-Animatronic if we're to be specific/Disney-friendly), but she still looks like a child. Therefore, seeing her run down by a truck is still rather gruesome. We also get to see cops vaporized, villainous A-A's blown up and beheaded, and kids getting roughed up by getting attacked by hologram dogs and blasted by security devices/forces. And this is PG? In the parts I was awake for, I was amazed that with all the violence involved in the film, that anyone would think this is a 'family' film. The plot (whatever it was) was confused, throwing so much at us and never pausing to set things up. It wanted to show us an optimistic world, multicultural and shiny, but then it makes Tomorrowland look like a quasi-Fascist state with a mad dictator. Shifting wildly between hope and despair (leaning heavily on the latter), Tomorrowland never figured out whether it was action, science-fiction, comedy, or virtual propaganda for the environmental movement, a second-rate Captain Planet. Let's touch on the performances. Clooney shows that charm can't an actual actor make. It's amazing that Clooney is only a year older than Tom Cruise (54 to Cruise's 53) because he looks at least a decade older. He is boring in the lead as the bitter George, who won't help save the world because it's already fated to be destroyed. Laurie was a cartoonish villain in search of a mustache to twirl (his end is more comedic than anything else). Robertson did nothing but scream and shout her lines and never convinced that she was this bright and plucky girl. McGraw had no reason to be here both in terms of character or actor (and I still think he has a hairpiece). Cassidy did pretty well as the robot Athena (though the shifts between funny and violent, sometimes in the same scene, is jarring). Still, when she is dying (a nice thing to see, a child robot dying), hearing "Entering Final Phase. Please state final words", or something to that effect, makes what is supposed to be a touching moment hilarious. Adding the suggestion that a 54-year-old man carries a torch for a twelve-year-old robot is wrong in so many ways. Shockingly violent, pessimistic with a faux-upbeat ending, boring (again, one can't help falling asleep), confused about what the story actually was, Tomorrowland is a horror. It almost makes me never want to go back to Disneyland. However, if this kills the idea of turning more Disney theme parks and attractions into movies, Tomorrowland may have done the world some good.